The recent meeting between Nawaz Sharif and Sajjan Jindal has raised a controversy inside Pakistan. While a section sees it as an unannounced back channel, others question the legality and protocol involved in terms of the Prime Minister engaging an Indian businessman at Murree. 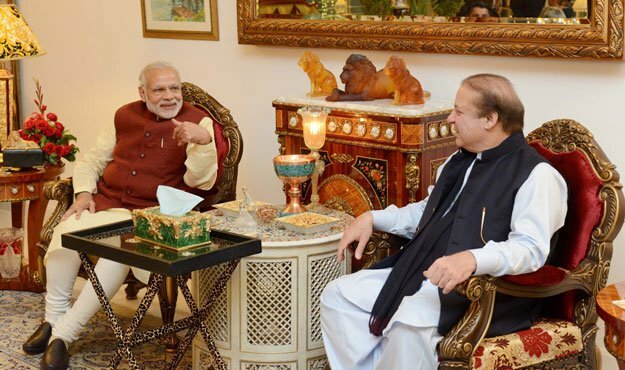 With Sharif-Jindal meeting as the background, this commentary attempts to answer three specific questions: what formal channels are available for the Prime Ministers and how effective they have been in the Indo-Pak context? Are there informal Indo-Pak channels, and how much influence do they have over track-I? Given the limitations and restrictions on track-I and track-II dialogues, should India and Pakistan look towards a silent back channel? First, a short critique of formal Indo-Pak channels of dialogue and their effectiveness in the last two decades. Democracies at the international level, normally conduct foreign relations through official channels led by their foreign ministries and Premiers. In the Indo-Pak context, to a large extent, the bilateral dialogues on various issues have been clubbed into the “Composite Dialogue” led by the bureaucracies at the highest levels. The Composite Dialogue (CD), in paper remains comprehensive. To be fair to the respective bureaucracies leading these dialogues, the CDs since the late 1990s, did attempt to address numerous issues. Though they were successful in mapping of issues under each category, in terms of actual resolution, they remained ineffective. The reasons are not difficult to fathom; the respective bureaucracies that led the dialogues remained “territorial” and did not understand the larger ramification Indo-Pak progress. The Indo-Pak (in fact the entire South Asia) bureaucratic DNA suffer from a particular strain, and have been inward looking. This remains the case, not only vis-a-vis Indo-Pak bilateral issues, but generally in moving forward with other countries as well. While CD may appear comprehensive, it has its own limitation as a formal channel of communication, and more importantly as an institution of conflict resolution. Since India and Pakistan have grouped the issues and conduct them together, non-success in one section has a domino effect on the other – slowing down the entire process. Unless, the CDs are compartmentalised and ensured that the slow process in one does not affect the progress in another, this will not be a viable option. In the present format, the CDs though look comprehensive and attractive, are unlikely to be an effective instrument for conflict resolution. Perhaps, the only exception to the above is the regular/periodic meeting between the Indus Water Commissioners on the IWT, irrespective of larger bilateral relations and the success/failures of the CDs, and the sharing of data on nuclear installations every January. The IWT meetings also are under stress during the recent months. Second, there have been Indo-Pak channels outside the formal institutions. Referred loosely as track-II, there have been dialogues between the two countries outside the CDs and related official channels on various issues. Most of the track-II dialogues are supported by sources outside South Asia (for example, the US, Canada, UK and Germany), and has been seen with an apprehension by the State. While some of these dialogues are comprehensive discussing all issues, some of them have focussed on specific issues such as nuclear and military cooperation, water issues, Afghanistan etc. Some of the track-II dialogues (for example the Chaophraya and Ottawa Dialogues) met on a regular basis even during difficult circumstances. Led by big names on both sides, the dialogues include former bureaucrats, retired military officials, academics, media professionals etc. While this is an useful resource, unfortunately, Indo-Pak bureaucracies tend to listen little to external inputs, even if it is projected through their former Secretaries and retired senior military officials. Unlike the West, our bureaucracies are not known for consulting with outside resources – both formally and informally. As a result, the track-II channel, despite the background of those who are involved remain under utilised. If the track-II has difficulty even in finding an effective opening into the respective ministries, it is highly unlikely that they would reach the Prime Minister. As a result, given the present structure of interaction between the State and track-II, the latter option also has limited use for the Indo-Pak Prime Ministers. Outside the organised track-II, there is a larger Civil Society initiative; led by few bilateral forums, they remain less organised and meet occasionally at the Wagah border with candles. Certainly, the Indo-Pak Prime Ministers cannot consider using these initiatives for any communication. Given the effectiveness of track-I led the CDs, and the reach of track-II, do the back channels provide an option at the highest levels? While one is not sure what was discussed between Sharif and Jindal, it is useful to look into back channel as an option. Given the level of discussions between Niaz Naik and RK Mishra in the late 1990s, a silent channel, led by few trusted people of the Prime Ministers could break the ice. Unfortunately both Naik and Mishra are not around; but there have been detailed interviews, especially given by Niaz Naik, now available in the public domain on what issues have been discussed, and the level of trust and focus. Of course, back channel diplomacy has its own weaknesses as well. The bureaucracies that remain territorial are not likely to see the back channel with an open mind. The security establishments also are likely to remain wary of such a one-to-one Indo-Pak dialogue answerable only to the Prime Ministers. Reports and discussions do claim on how the back channels were disrupted by the formal ones. In India, there is a suspicion that certain State and non-State actors do disrupt, whenever there are back channel efforts. For example the recent brutal killing of Indian soldiers or the attack on Pathankot in 2016 is seen as a deliberate attempts by actors within Pakistan to scuttle a direct communication between the two Prime Ministers. Outside the above, the media and political parties, suddenly get interested in being “democratic” (in terms of being discussed or approved by the Parliament) and “transparent” (in terms of having the right to know what is being discussed). Given the restrictions of track-I and track-II led dialogues as an option for the Prime Ministers to break the ice, and make substantial progress, perhaps it is useful to invest in silent back channel diplomacy. Let us not demonize this option.